Esprit 120 ED, Apogee U16M and filterwheel are connected to power supplies and pc by cabling that pass through the mount and pier, and a conduit under the floor. A direct drive mount (DDM) requires excellent ballance on both axes. There is no clutch or break on the declination and polar axis. A ring of permanent magnets produces torque against a ring of electromagnets in order to rotate and lock the axes. To counteract imbalance, the processor increases amperage to the electromagnets to exert opposite torque. When the torque becomes too large, the control program shuts down the axis to avoid overload. 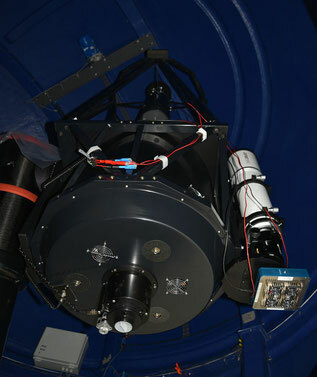 The Apogee filterwheel (bottom right) must be turned inward to avoid collision with the dome rotation ring. Consequently, the refractor must be pushed back several centimeters from the balance point so the filter wheel will not hit the backplate behind the main mirror of the Cassegrain. The center of gravity is now shifted away from the declination axis. The mass of Esprit 120 + U16M + filter wheel = 16 kg. To compensate, it is necessary to increase the mass of the secondary mirror support ring on the Cassegrain. 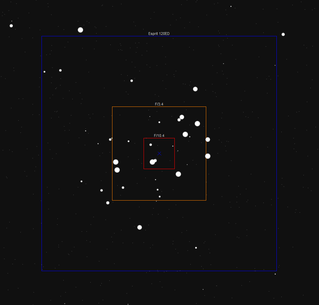 The map of the Pleiades shows the photographic field of view of a Kodak KAF-16803 CCD sensor. The sensor's surface area is 36.8 x 36.8mm. 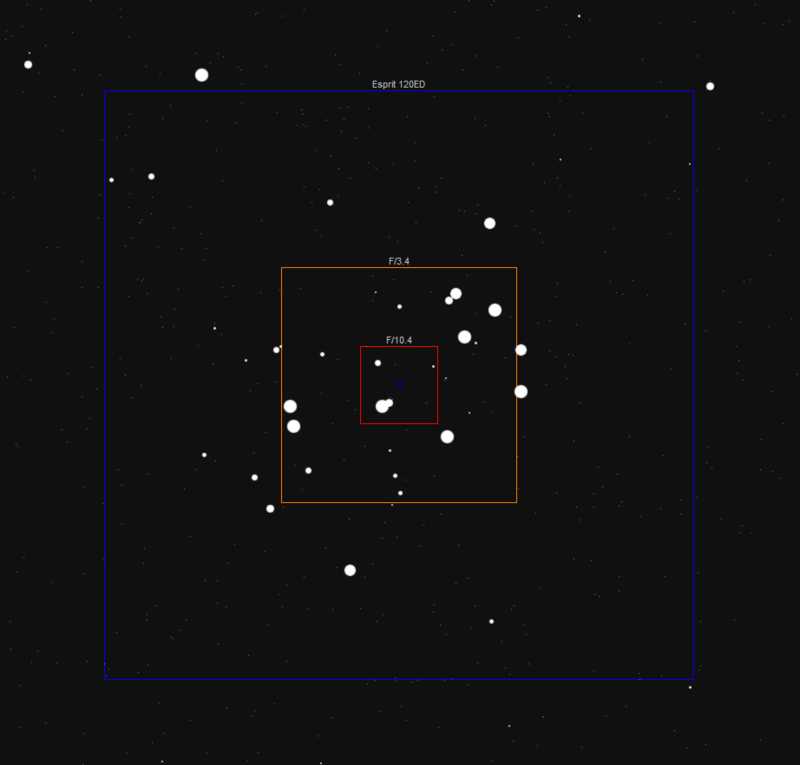 The blue square shows the field of the Esprit 120 (840mm f/7). The orange rectangle indicates the field when the camera is placed at primary focus (2108 mm f/3.4). The small red square represents the image field when the U16M is mounted on Cassegrain focus (6448 mm f/10.4). Maps and field markers are from the planetarium software C2A, version 2.1.2.